The Art of Zen: From Mind to Form. Kyoto National Museum 2016, April 12 through May 22. This is an exceptional exhibition of Japanese paintings, both secular and non-secular, held in the repositories of Japan’s most important Zen temples. Of over 300 items being exhibited, 24 are national treasures and 134 are important cultural properties. For one month, the exhibition will be initially showcased at the Kyoto National Museum before it is moved to the Tokyo National Museum later in the year. The exhibition is being held with the full support and cooperation of all the head temples and affiliated temples of Japan’s 15 branches of Rinzai and Obaku Zen. 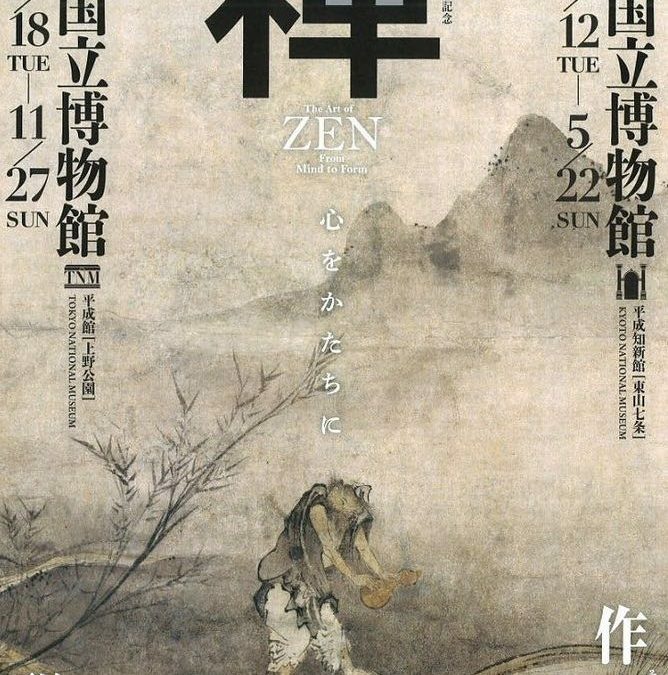 The show has been designed to afford us a glimpse into the essence of Zen culture and its powerful influence on the formation of Japanese culture. The initial display rooms of the exhibition focus on early Chinese and Japanese portraiture of Zen priests and military generals. Such a concentration of comparable paintings has never been assembled before. Each painting is fascinating and can make one feel as if given direct insight into the individual characters and personalities of the subjects. Interestingly, the facial expressions and poses of the figures are understood and accepted as generalisations, as opposed to the purely individualised portraiture found in Western art. . The remaining display rooms of the exhibition largely showcase secular painted treasures from the Muromachi and Edo periods. All of the many works are breath-taking; however, a rare sighting of Dragon and Tiger, attributed to Muqi from Daitoku-ji Temple, is particularly noteworthy. Kano Motonobu’s Flowers and Birds of the Four Seasons from Daisen-in Temple has perhaps never been as clearly displayed. The face of Hakuin’s Kannon verges on the divine, Sengai’s humour and spontaneity remain irrepressible, and Ikkyu’s calligraphy is mesmerising. The paradisiacal quietude of Kenko Shokei’s Scenery of Divine Beauty provides a dramatic contrast against the raw emotion and power of Sesson Shukei’s Lu Dongbin. The recently constructed and opened Heisei Chishinkan Wing of the Kyoto National Museum is spearheading a revitalisation of the appreciation of traditional Japanese arts. There have been an increased number of specialised exhibitions, steady streams of visitors, and helpful and active staff at every turn. Fearing they lacked intimacy, I was originally somewhat sceptical of the display rooms within the new wing. More recently, I’ve come to appreciate what the galleries do offer: spacious rooms that allow many viewers to simultaneously appreciate the art and the ability to comfortably display very large paintings. All artworks are necessarily displayed behind glass; however, the distance between the paintings and the glass is minimal. In addition, quality lighting allows viewers to appreciate and understand the brush work at an intimate level. The new wing is a great asset to Kyoto and Japanese art in general.